If you missed out on Lady Gaga's first Autumn date at Twickenham Stadium, you'll be pleased to hear the one-of-a-kind singer is to play a second date on 9 September. Tickets are an incredible £70 + bf, from 9am. Good grief. Megadeth have been going for the best part of 30 years, and have had the best part of 20 different members to boot. Camden's Electric Ballroom will play host to them on 12 June. Tickets £35 + bf, but not available until 7pm. Political folk-rockers Levellers have a fascinating past and are still going strong. And with a cracking live reputation, you might want to see them at O2 Shepherd's Bush Empire on 24 November. Tickets £25 + bf, from 9am. It can be hard to pigeonhole The Cat Empire once you've seen them live. With unending energy, the Australian ska-jazz-funk-rockers are masters at creating a feelgood, party mood. They play O2 Shepherd's Bush Empire on 9 December. Tickets £25 + bf, from 9am. Beth Jeans Houghton is fast making a name for herself with her unconventional-yet-enchanting folky sound, and you might well have heard her on 6 Music lately. See her at King's College London Student Union on 26 September. Tickets £10 + bf. Also booking: Sparks at Barbican, another night for Tenacious D at O2 Brixton Academy, Camden Crawl (which has just announced added The Cribs) and Jesca Hoop at Bush Hall. 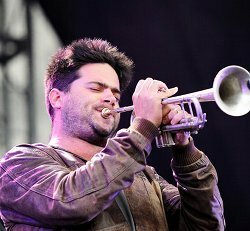 Image of The Cat Empire from stusev under Creative Commons on Flickr.